Briefing with Ambassador Dore Gold, Director Israel Ministry of Foreign Affairs and former Israeli Ambassador to the United Nations and author of The Rise of Nuclear Iran. Meet Women in Green founder Nadia Matar at the Gush Etzion Oz Vegaon Park established in memory of Gilad, Ayal & Naftali who were kidnapped and murdered just down the road by Arab terrorists. Visit Beit Hadassah, and Me’arat Hamachpelah, the Tomb of the Patriarchs and Matriarchs. Meet Sheikh Jabari the former Mayor of Hebron and a key power player in the area. Learn about Arab – Jewish ties in Hebron and how the sheikh’s involvement over the years has prevented violence. 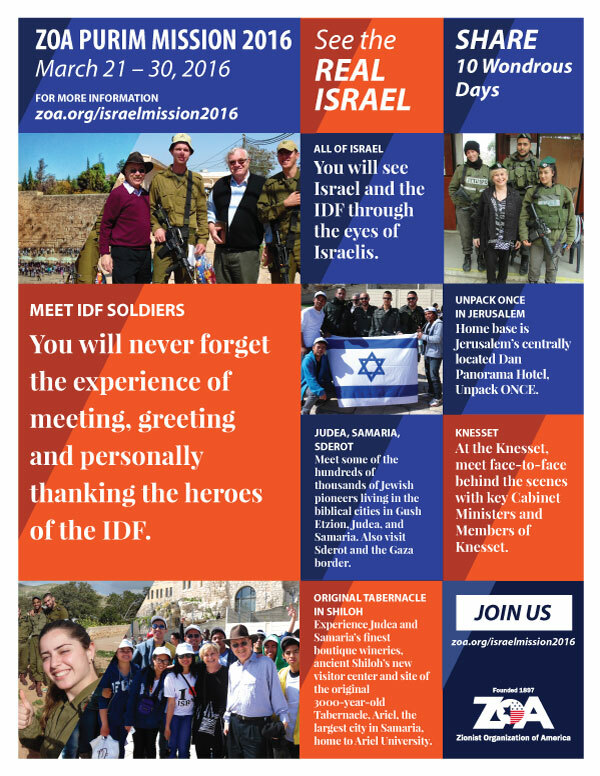 Join ZOA Israel Office Director Jeff Daube for an in depth exploration of Mt. of Olives. See first hand the results of the ongoing Arab vandalism and learn about the leadership role that the ZOA is playing in the USA and Israel to bring attention to this issue. Visit and meet residents of Maaleh Zeitim, a Jewish neighborhood on the slopes of Mt. of Olives. See the struggle for Jerusalem first hand on Jerusalem’s northern “seamline”. Visit Givaat Hatachmoshet, Ramot, Nebi Samuel, and Tel El Ful where King Hussein began to build his summer palace. Walking tour to the famous windmill and the first neighbourhood built outside the Old City walls by Sir Moses Montefiore in the 1860s. We’ll head north to the Shomron to meet local residents and leaders and gain better understanding of why Jews choose to live here in the “West Bank”. We’ll start at Psagot, a Jewish community “settlement” overlooking Ramallah and the Coastal Plain to the west and Wadi Kelt and Jericho to the east. See the homes of “New Migron” and learn the story of the destruction of the original Migron. Tour, taste and lunch at the Psagot Winery. Visit Ariel, the largest Jewish city in Shomron including Ariel University which has over 14,000 studetns. Dinner at the Eshel HaShomron Hotel with owners Menachem and Tova Gilboa. Hear their remarkable story of Zionist commitment, bravery and survival in the face of terror. Depart to Sederot whose residents have endured over 10 years of rocket attacks by the Palestinian forces that control the nearby Gaza Strip. Meet local residents who will show us the city and border areas and share their experiences with us. Learn about how they cope with constant threats from Hamas controlled Gaza. Meet Jewish farmers who are struggling to strengthen the Jewish presence in the Negev and are facing hostility from Arab neighbors and government bureaucrats. Return to Jerusalem for evening and dinner on your own. Join Ateret Kohanim for a behind the scenes tour of the Old City of Jerusalem and the struggle to maintain and expand the Jewish presence. Dinner and session with Nitsana Darshan Leitner Director of Shurat Hadin Israeli Law Center an Israeli based civil rights organization combating terrorist organizations and the regimes that support them. Head to the studios of online radio station “Voice of Israel” and meet Executive Producer and veteran journalist and leader Dan Diker. Briefing and tour with analyst Yitzhak Sokoloff including overviews of the Coastal Plain, Tel Aviv, Ben Gurion Airport and Security Fence. Gain insight into the security issues involved with potential Israeli territorial concessions. Listed activities and speakers are subject to availability and confirmation. All underlined meals are included in the package price. 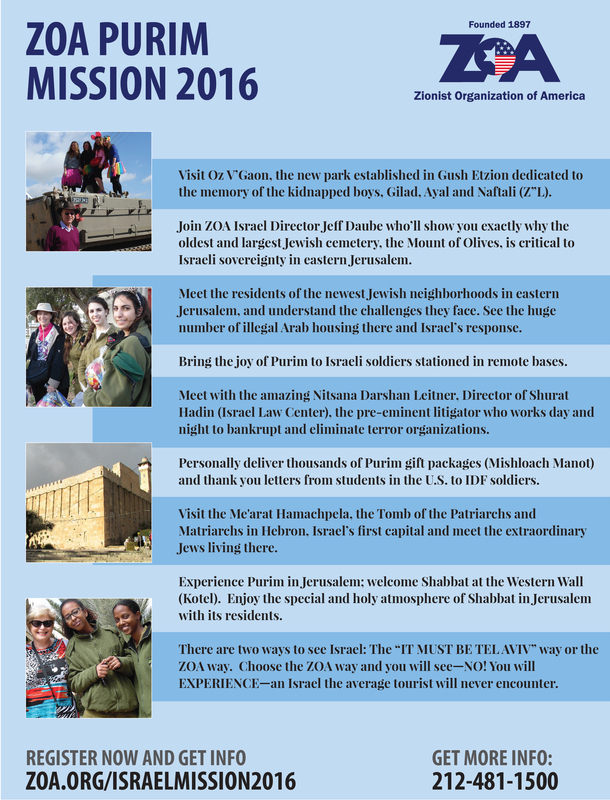 This itinerary is proprietary to Keshet and is intended for the promotion of and to inform those considering joining this Keshet trip. It is not to be transmitted to any other party without prior authorization from Keshet. Price includes Standard Tips & Gratuities for guides, bus driver, hotel bell staff and waiters for included meals. If there will be fewer than 25 paying participants, the price per person will increase. Keshet strives to offer fair pricing and therefore does not budget for contingencies resulting from weather or security issues. Itineraries may be altered as a result of these factors. Also, the prices listed reflect rates quoted by hotels and vendors as of June 2015. In the event of devaluation of the US dollar exchange rates, hotels and other vendors may add surcharges; Keshet reserves the right to pass such increases on to trip participants. The program will begin midday (exact time to be determined) on Monday March 21 at the Dan Panorama Hotel in Jerusalem The Keshet staff will be happy to help you arrange and pre pay for taxi services from the airport to the hotel if you so desire and to help you with any additional accommodations or touring services that you might need to arrange prior to or after the trip. There will be one group bus drop off at Ben Gurion Airport in Israel on Wednesday evening March 30 at the conclusion of the trip. The exact times of the airport transfer will be set to meet the flight departure time of the majority of the group. Please note: If your flight departs Israel at times other than the provided group airport transportation, you will be responsible for the cost of your own airport transportation. All site admissions and programs as per the itinerary. Please note: We cannot accept responsibility for any losses or expenses which you or any member of your party may incur as a result of failure to secure adequate insurance coverage. Trip Insurance Keshet urges you to purchase cancellation insurance and supplemental medical coverage (which covers preexisting conditions). We recommend the “Cancel For Any Reason” policies which offer the broadest coverage. Please note that most insurance policies require purchase within 14 days of your date of registration for the trip. While you are free to purchase insurance from any company of your choice, Keshet has made arrangements with SMS-Travel Insurance Center of Omaha, Nebraska. SMS has over 25 years of experience as worldwide insurance brokers and can help you choose the policy that best meets your needs. Our contact persons are Yonah Engel & Dani Eisenstock: E-mail: info@travelinsuranceisrael.com USA phone: 1-888-747-3773 Mention promo code: KESHET Please note: We cannot accept responsibility for any losses or expenses which you or any member of your party may incur as a result of failure to secure adequate insurance coverage. Keshet: The Center for Educational Tourism and Educational Encounters International, Inc. act only as an agent for the tour participants in making arrangements for hotels, transportation, touring, restaurants, or any other services in connection with the itinerary. We will exercise reasonable care in making such arrangements. However, we do not assume any liability whatsoever for any injury, damage, loss, accident, delay or irregularity to person and property because of an act of default of any hotel, airline carrier, restaurant, company, or person rendering any of the services included in the tour. The right is reserved to cancel or change itineraries or to substitute comparable service without notice. The right is reserved to decline or accept or retain any tour passengers should such person’s health or general deportment impede the operation of the tour to the detriment of the other tour participants. Rates are based on standard rooms unless otherwise indicated. No refunds will be given for unused package inclusions. Itineraries may be altered as a result of security, logistics or weather concerns determined by either Keshet or the contracting group. Costs associated by such changes are the responsibility of the group. In the event of devaluation of the US dollar, hotels and other vendors may add surcharges; Keshet reserves the right to pass such increases on to trip participants. Keshet may use photographs/videos taken on the trip for promotional purposes. If you do not want your photo/ video to be used please notify us in advance. Pricing is based on a minimum number of participants. Should the group number fall below the minimum, Keshet reserves the right to alter the program and/or recalculate the pricing. Trip Pricing $2,980 Land Package Price Per Person in double occupancy hotel accommodations; based on a minimum of 25 participants. If there will be fewer than 25 participants, the price per person will increase.